OMG! This is soooo good. Everyone should go out and make it immediately! I love lamb. I never cooked with it until recently (that whole vegan/vegetarian thing precluded it) but I absolutely love it now! Lamb stew! Lamb meatballs! 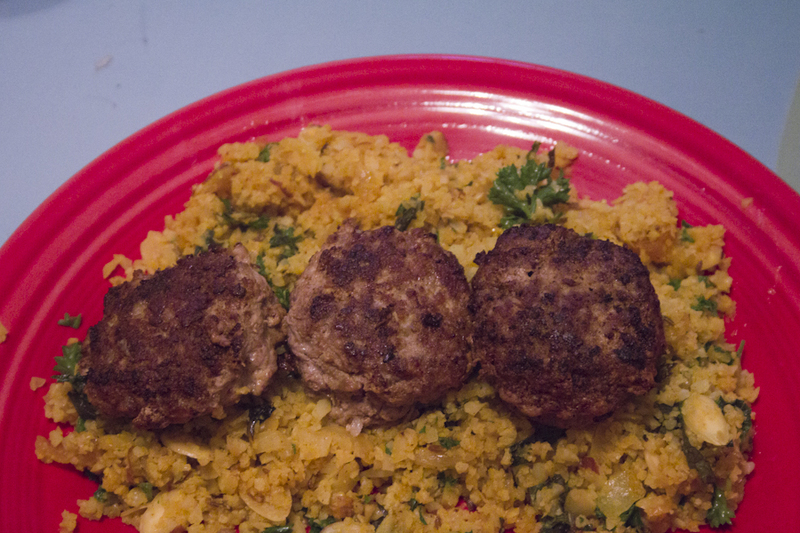 And it works well with the Mediterranean flavors I’ve been playing with recently. I prepped everything and then cooked the patties and let them rest. I then drained most of the grease from the pan and cooked the cauliflower in the same pan (no need to add coconut oil). The cauliflower dish comes together so fast that I just popped the patties on top of the cauliflower and served! If you don’t have mint or parsley this dish is still excellent without them. 1. Combine all of ingredients, except the bacon fat, in a bowl and mix by hand. Shape into sixteen 1/2 inch thick patties. 2. Heat the bacon fact in a 12-inch skillet over medium-high heat. Once the skillet is heated add the patties in batches and cook, flipping once, until browned on the outside and barely pink in the center – about 7 minutes total. 1. Heat a skillet over medium heat with the coconut oil. Once the oil is melted add the onion and heat through until softened. Add the salt, turmeric, and cumin and stir to mix. 2. Add the cauliflower, stir to mix until the cauliflower is uniformly golden. 3. Add the apricots and almonds and cook for about 5 minutes, and parsley and mint and serve. That looks amazing! I’ve never cooked with lamb, might have to try it!! Lamb is the best stuff ever!